The Omni Group has updated OmniFocus, its flexible task and project manager, adding a number of organization, sharing, and sync updates. New in OmniFocus 1.8 is a more flexible View Bar for filtering projects and contexts. All types of items—including groups, projects, and Inbox items—can appear in context lists, and both projects and groups are now able to become “next actions,” saving you time while organizing. You can now share Perspectives (such as Inbox, Flagged, and Due) as files simply by dragging them out of OmniFocus. A new bookmarklet lets you send a browser page to OmniFocus as a task (a feature that’s already in the OmniFocus iPhone app). Clean-up operations now happen automatically when you switch views, and the company has improved synchronization speed and stability as well. 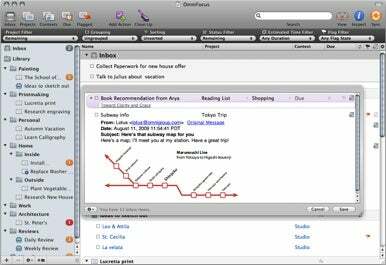 OmniFocus for Mac requires Mac OS X 10.4 or later, and costs $80 (there’s a 14-day free trial available as well).